Driving a Jeep Wrangler makes you want to run things over. Not in a malicious way, but in a “I could tackle that curb,” or a driving through rather than around potholes and other road obstacles kind of way. Of course, that’s what the Wrangler was built for: tackling obstacles with aplomb and handling nearly any off-road condition you can throw at it. For 2018, the iconic Wrangler was redesigned, but in a way that honored its sacred heritage and, in fact, improved on many of the features that make it a perennial favorite. It’s been 11 years since the last update, and what hasn’t changed is that the new JL is still the most off-road capable vehicle you can buy. To the naked eye, Wrangler remains much the same, still eliciting the famous “Jeep nod” from fellow enthusiasts, but the changes run deep. First, improvements were made to optimize the on-road driving dynamics, reduce weight, and improve fuel economy. These include using high-strength, lightweight aluminum closures, and hollow track and stabilizer bars. The five-link coil suspension has been re-tuned to create a more comfortable road feel on the pavement, and the shocks have been recalibrated to give greater balance between on-road handling and off-road capability. Electro-hydraulic power steering delivers a more pleasant, less vibrato steering feel, and helps improve fuel economy. Jeep drivers who plan to use Wrangler in the manner it was designed for – off-road exploration – will appreciate the Trail Rated 4x4 capability, and the ease with which the new Wrangler converts to an open-air SUV. The Rubicon model tested here was equipped with an all-new premium Sunrider soft top, that retracts quickly and easily thanks to clock springs. No more debating whether it’s worth the time and frustration to remove the top, and dreading the labor of putting it back on. The new top is quieter on the road than previous cloth tops, but on a long road trip to Las Vegas, my kids still asked, “What’s that noise?” once we picked up speed on the freeway. Still, Wrangler’s on-road manners are vastly improved, rendering it more than tolerable as an everyday driver and a go-anywhere adventurer. While wind noise was still an issue at higher speeds, road vibration and harshness are not. A Sky One-Touch power top is available on four-door Sierra and Rubicon models. A black (or body color on the Sahara and Rubicon) hardtop option is available as well, offering even more open-air options. The windshield still folds, but this operation, too, has been simplified, using a four-bolt design at the top. And a new headbar connected to the A-pillars keeps the rearview mirror in place when the windshield is down. New lightweight doors are also removable, and the Torx bit tool size is stamped onto the hinge to eliminate guess work. As expected, Wrangler still boasts industry-leading capability, with improved approach, departure, and breakover angles. Four skid plates protect critical vehicle components, and Rubicon models get steel rock rails to guard against body damage. It has a ground clearance of 10.9 inches and can ford up to 30 inches of water. Of course, Wrangler still sports its iconic profile and seven-slot grille, but with a lowered beltline and larger windows for better visibility. Inside, the look is rugged, yet stylish, with high-quality materials and precision craftmanship. Most functions are controlled via a standard five-inch or available seven- or 8.4-inch touchscreen. Both Apple CarPlay and Android Auto are available via the fourth-generation Uconnect system. There are plenty of storage areas throughout, four USB ports, 12-volt accessory outlets, and a 115-volt AC outlet. You’ll travel in comfort during even the most rugged excursions. 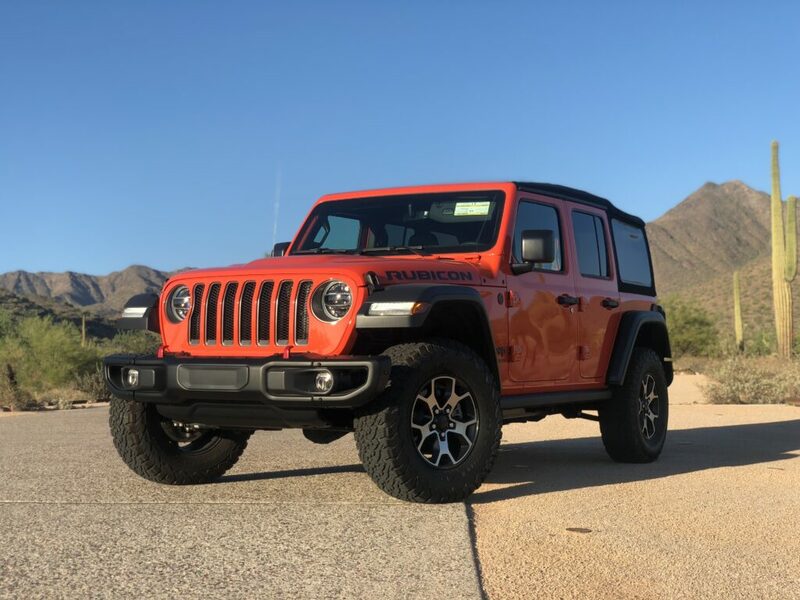 Our Wrangler Rubicon was powered by the 3.6-liter Pentastar V-6 engine, paired with the optional eight-speed automatic transmission, and delivering 285-horsepower. It was smooth and efficient under all driving conditions. The appeal of the Wrangler is unmatched in the SUV world. It is the original, and still the best – made even better by recent tech, engineering, comfort, and design refinements. It can make even the most reticent driver feel badass, even if you don’t want to drive over stuff. What I Loved: What’s not to love? The new JL Wrangler remains true to its heritage, while improving in nearly every way. You can go anywhere in a Jeep, and look good doing it. And while the price may be intimidating as you increase features and capability, Wranglers are always in demand and command excellent resale value. What I Didn’t: Not much. Although, I would recommend sticking with the V-6 engine for a more refined on-road performance, as you may experience slight turbo lag and noise under heavy acceleration with the four-cylinder.